It’s that time of the year again when the weather starts to change, and it seems like the whole entire city is lighting up in the spirit of the holidays. That means right around the corner is the Phoenix Zoo’s spectacular annual light show event rightfully dubbed Zoolights. The Phoenix Zoo has announced the dates and times for this year’s extravaganza. Zoolights is open and in full effect from Nov. 22 – Jan. 14 and the Phoenix Zoo’s gates are open each event day from 5:30 p.m.- 10:30 p.m. While some animals at the zoo will probably not be available for viewing during the hours of the Zoolight’s nightly activities, some nocturnal creatures may still be up to join in the fun. Not to worry though because there are plenty of other exciting things for you to discover when the sun goes down and the Phoenix Zoo lights up! 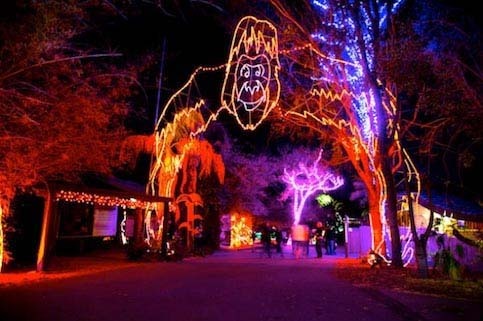 Visitors to the Phoenix Zoo during these exciting fun-filled nights of wonder have a vast array of activities and spectacles to help get them in the spirit of the season. The people that attend Zoolight this year will be witness to a number of beautifully choreographed light shows that will glimmer and shine. There are other special performances planned as well such as Lakeside Music-in-Motion shows available to groove and belt into the night. Who could forget the beautiful center piece of this event-the Phoenix Zoo’s breathtaking three story-tree. Sparkling lights keep the tree lit for every night of this festive tradition. Among rides available to the guests and their children, they can enjoy a colorful ride on the carousel. They can also hop on the back of a friendly camel and take a ride around the Phoenix Zoo while getting the opportunity to have a close encounter with these majestic creatures. Of course, the legendary Santa Claus himself will be there to meet, greet, and take pictures with all his loyal fans, so make sure to stay off his naughty list for when you stop by and visit. There will also be nightly scheduled snowfalls to really inspire the feelings of the season. These are all just some of the activities available for zoo-goers to enjoy during the dates of the Zoolights event. All are welcome to come to this delightful event and you can bring the whole family to build wonderful memories over this holiday season.